It was a really crazy month. Both my kids fell sick. Not just the normal flu and cough, but a full-blown-super-high-fever-kinda sick! It was enough to make me go crazy. It all started with Khye. He was having mild fever for about 2 days and then it went off after taking PCM. And after a few more days, the fever came back, and this time with a vengeance. Khye had high fever for 1 week to be exact. 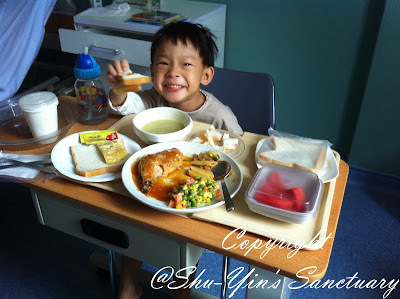 After having high fever until day 4, I took him to see his paed. 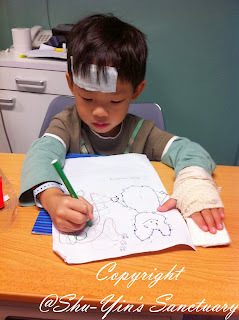 The doctor was a little concern because it has been four days of high fever. His temperature read 39.1 dC although he had just taken PCM 2 hours before. So his paed asked to do a blood test and also a urine test to check on Dengue Fever and the rest. So Khye was screaming murder in the lab room, my poor baby. Dengue test came back negative, and the doc said it should be just a viral fever and it would pass. But his temperature continued to soar. At home it was so difficult because my Khye hates taking meds orally. He would scream and would not swallow. And as the meds trickle down his throat, he would cough and then he would try to vomit it out. Yes, that's my Khye. Sigh. So many a time, he ended up vomitting out the meds, and then we would have to feed him again. And so another round of battle with Khye and meds. 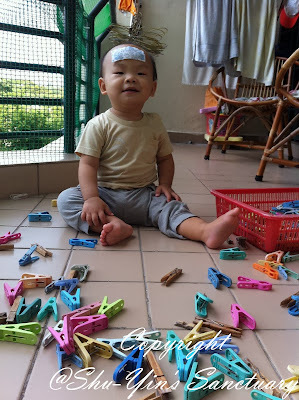 And even then, I still needed to sponge him down as his fever would always be above 39 dC, and sometimes even above 39.5 dC which is very worrying. And at night, those were sleepless nights for me as I kept waking up every half an hour to check on his temperature. As you know, during night time, our body temperature rises a little more so I was worried that it would get too high. I would be ok if Khye was still all active and such. But to tell the truth, he was not. He was being very lethargic and clingy and refused to play by himself on the floor. He only wanted to be carried all the time. He was not being his usual cheerful self. 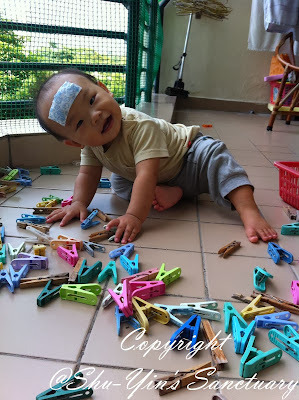 There were times when he was ok when the fever went down for a few hours. He was smiling happily. We went back to the doctor on Day 6 as fever was still there, and this time the doctor got more worried and he asked for a second round of blood test. I had no choice but to agree. Results came back negative again and I got very worried because the doc didn't even know what caused the high fever. 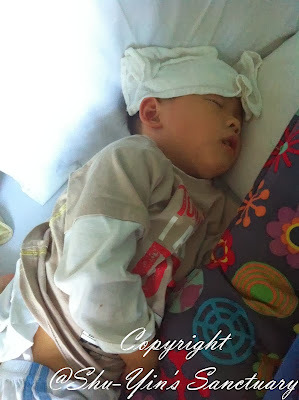 On Day 7, Khye was still having fever and I got so stressed up I cried. I cried because I was so worried about my baby. Worried because I have not encountered such high fever for so long. And I cried also because I was so stressed up. And suddenly, miraculously, the fever was gone on the night of Day 7. Just like that. After having high fever every day for the past 1 week, it was all gone after Day 7. Phew. And then about 2 weeks later it was Shern's turn. 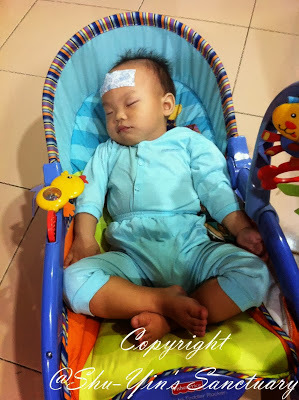 Initially, it was just a low-grade fever for a night. And then he had some discharge on his right eye (which I think was passed to him by my aunt who had conjunctivities). So we took him to the doc. 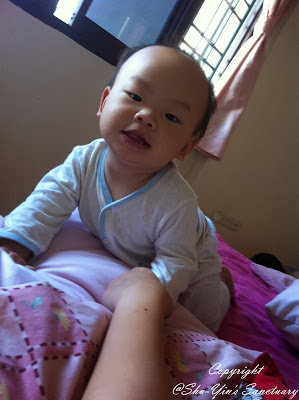 He was prescribed eye drops and we also noticed he had a warmer than usual body temp (about 37.5 dC) but no fever yet. However, he got worse at night and his temperature soared until 39.5 dC but after PCM it came down. So we brought him back to see his paed. His temp was still 39.1 dC even after PCM just an hour ago. We went home with a bottle of ibuprofen, just in case. But afternoon came and he got worse. His temperature was still 39.6 dC even after ibuprofen 1 hour ago. And it was not even night time yet. And Shern was shivering there and feeling bad. So I knew I needed to bring him back to see the doc again. 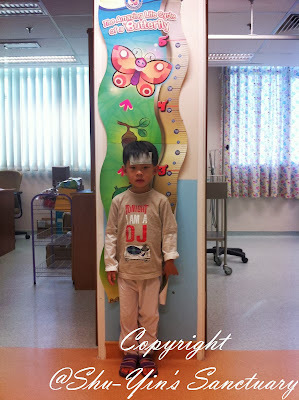 As I suspected, doc asked him to be admitted as his fever is really high. I agreed because his fever was quite uncontrollable. So high even after meds. 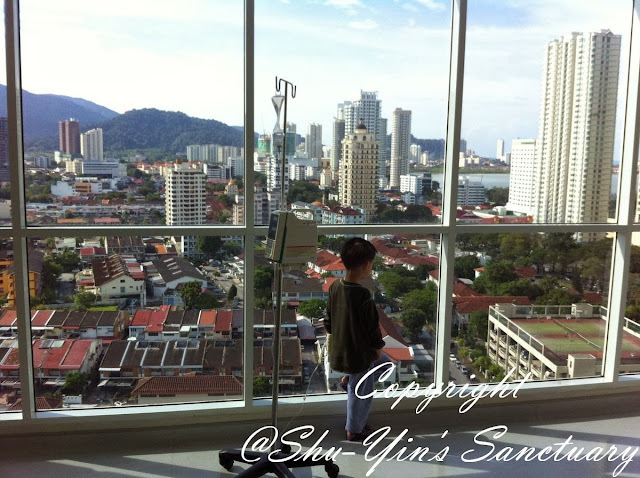 This was Shern standing on the height chart, waiting to be admitted. By the way, we waited 2 hours for us before we were admitted to a single room in GMC. Shern was quite brave and only bawled for a while when his paed himself poked his hand and inserted a cannula on his left hand. And he also took some blood to check for Dengue, Influenza A&B, etc. 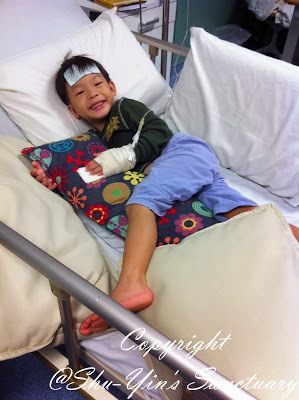 This is Shern giving us a wide smile when his fever got under control. Tests came back negative on Dengue and Influeza. White blood count went up and doc suspected bacteria infection. So he was put on antibiotics. It was the first time ever Shern was on antibiotics. Shern had it really bad this time. 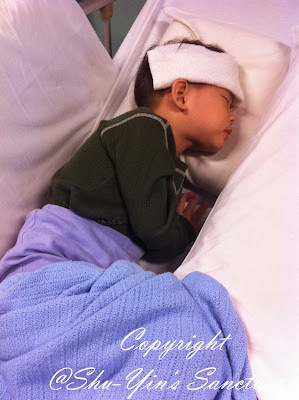 His fever shot up until very high, it was mostly above 39 dC even after meds. And PCM didn't seem to be able to work at all, he needed ibuprofen. And even then it was still high. I had to keep sponging him to bring the temperature down. It even went up to 41 dC once and gave me quite a scare. Night time was worse, I had to check his temperature every 1/2 hourly. 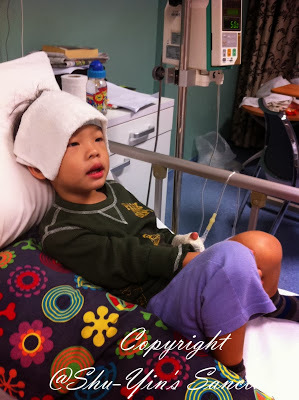 And on the 1st and 2nd night at the hospital, his fever couldn't come down even after 2 hours after ibuprofen. It was still above 39.5 dC. Shern was already shivering but he was asked him to lie down on a cold pad (hoping to bring the fever down) and I was sponging him non-stop. 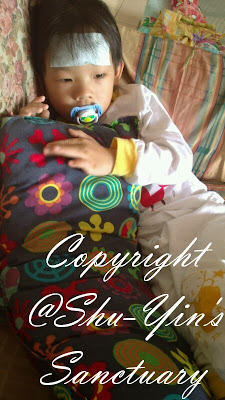 It was difficult to keep sponging him as he was cold and sleepy and cranky. Who wasn't when the fever goes until so high! 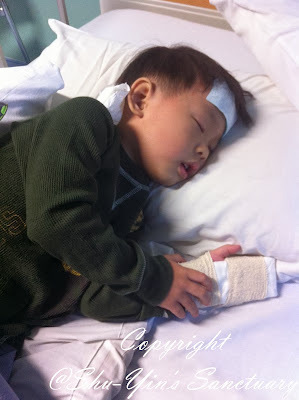 His paed even came to see him at 3am in the middle of the night, checking for other symptoms such as Kawasaki disease, etc. He showed no such symptoms though. But it was good of the paed to come to check on him. 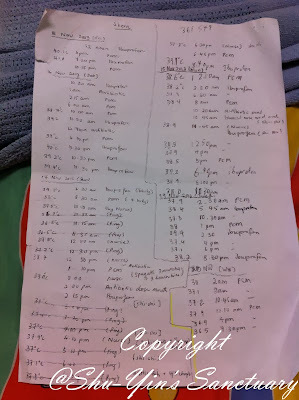 Look at the amount of PCM and ibuprofen he took on the days in the hospital. And this list was not even completed yet. 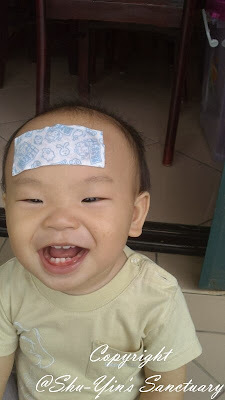 Some of the times, when his fever came down (usually only about 2 hours before it spiked up again), he was all smiley and happy like these. 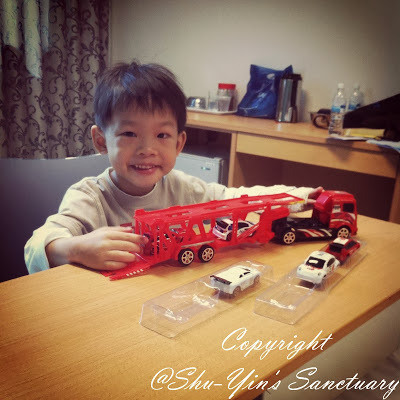 We bought him a cheapo toy truck from the store downstairs. 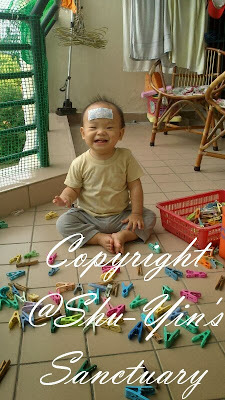 It was such a poor quality toy, very flimsy and I think totally not worth the RM20 we paid for it. But there was not much choice when we're cooped up in the hospital. Good thing is he was happy with it. But most of the times, he was like these, with either a cool hanky or a Kool Fever on top of his forehead, for I kept on sponging him down. And by the 3rd day, Shern was put on drip because his fever got too high and used up a lot of water in his body. Although Shern drank a lot of water initially, I realized that he seldom went to the toilet. And when he did, his urine was very yellow and his lips cracked. So his paed decided to put him on drip. It was such a pity seeing him confined to a machine with just a short wire length of freedom, but we had no choice. He was sad not being able to run as freely. But the drip was for his good. And slowly his urine was less yellow. Doc did a blood test for Mycoplasma bacteria and it came back positive, and so Shern was put on another antibiotic for that. Doc hoped that would be the cause of the fever, and not multiple bacteria infections. We would just needed to wait and see for the antibiotics to take its course, and to wean off the fever. 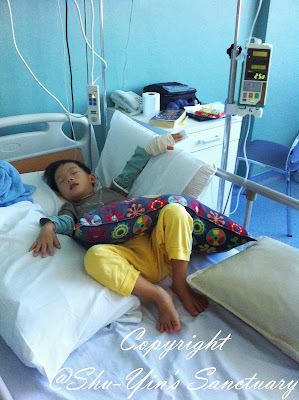 It was difficult for me too as I took care of him in the hospital mostly (Pho-pho tried one night to relieve me, nut Shern bullied Pho-pho and wouldn't cooperate to take meds, etc), so it was mostly me. I was in a difficult position because Shern needed me in the hospital, and Khye too needed me (need my breasts actually lol). Khye can now eat some solids, but he wouldn't drink much water. He wants nen-nen only and not milk in the bottle, but fresh from the source, lol. It was actually not funny then. I was all stressed up because I needed to be at two places at the same time. Both my kids needed me then. But then I needed to prioritize and so I stayed with Shern. And then hubby or dad would bring Khye to the hospital downstairs and I would let him latch for 1/2 hr twice a day. I bathed and washed and scrubbed my hands vigorously before carrying Khye, hoping that whatever germs won't be passed to my baby. The other times I would just express and throw away. I needed to breastfeed Khye so that he would not be dehydrated and he gets his liquid intake. The last thing I needed was for Khye to also fall sick. So I was also very tired and with lack of sleep and very stressful. And guess what, that led me to have yeast infection at the end of the hospital ordeal. Sigh. Anyway, back to Shern. 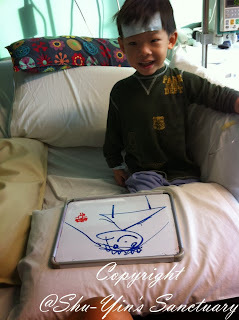 We killed time in the hospital doodling on white board, and also with home made activity sheets. It was really boring times in the hospital. We dared not venture out from our hospital room too often, because I was afraid of other illnesses (heard our next door rooms patients had Dengue, H1N1, etc...sounded scary!) because Shern's immunity system was low then and might be easily infected. 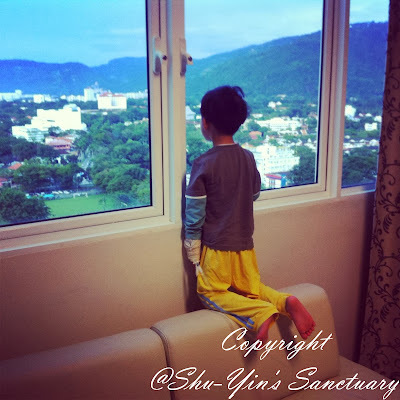 So most of the time, he would just stare outside our hospital room window, staring longingly at the outside world and spotting playgrounds and cars and beach, etc. 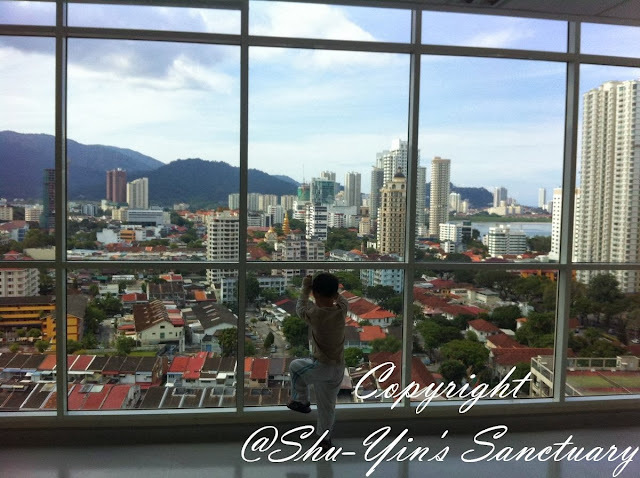 But once a while,we would just walk near the lifts where there was a big panel of windows showing a marvelous view. 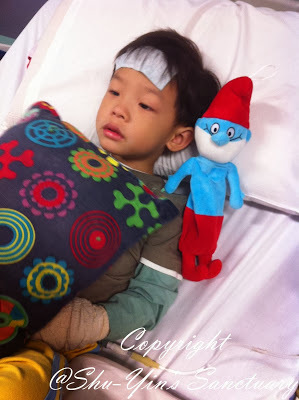 He had a new friend to accompany him in the hospital from a visitor, our neighbour. Thanks Aunty Su Li. And after that on Day 6, he got better. Fever for only twice (one low grade fever, and another time high fever) the whole day and then we got hopeful. 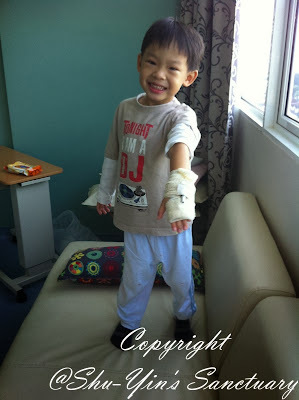 That night he had no more fever and so doc gave us the green light to be discharged. Yay! 7 days in the hospital and we were going home! 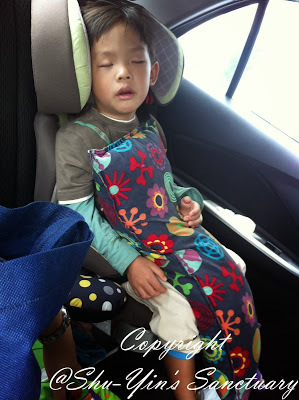 This is Shern in his carseat in the car on the ride home. He konked out in the car too. But it was alright. We were going home! 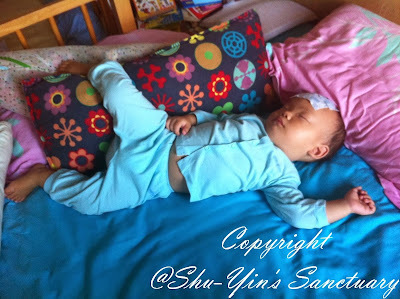 So this sums out the stressful times on how both my kids had high fever for a week each! Needed to document this down as this is part of life, and part of us growing stronger as a family. And now we are back to our home sweet home. 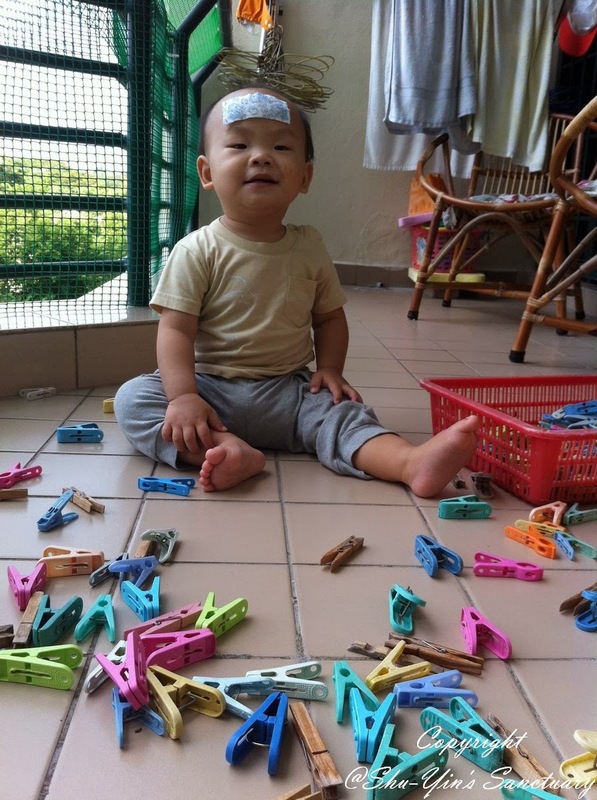 And Khye is so happy to see his mummy 24 hours a day again! lol. And thank you all for your prayers. Oh dear... so sorry to hear about this tough time you all had through. Us mums really shoulder the biggest burden when the kids fall sick. I'm sure you're doing all you can to keep yourself as healthy and strong possible (except for the little setback with the yeast infection, which I know from personal experience is no picnic). That photo of Shern staring longingly out the window is absolutely heartbreaking. He is such a trooper. Glad to hear he pulled through this infection valiantly. Hope the remainder of his recovery and strengthening period goes smoothly with no further setbacks. Take care of yourself, Shu-Yin. Yes, it was indeed a very heartbreaking and stressful weeks for us. It is always not easy when we see our kiddos fall sick. And we especially need to toughen up as we are the walls of support during these times.